Next we take a look around the ancient capital city of Kyoto. Kyoto, in fact, means capital city. It was Japan’s capital for over a thousand years and was originally the country’s largest city. Located in a valley of the Tamba Highlands in central Honshu, Kyoto, with a population of around 1.5 million, is part of the Kyoto-Osaka-Kobe metropolitan area. The city, which was originally built using principles of Feng Shui, was destroyed in large part during the Onin War, when battles between Samurai factions raged from 1467-1477. Kyoto was rebuilt at the end of the 16th century by Toyotomi Hideyoshi, but once again fell victim to widespread destruction in 1864, when the Hamaguri Rebellion resulted in the burning of 28,000 houses. Shortly thereafter, in 1869, the emperor moved his seat to what is now Tokyo and Kyoto lost its status as capital city. Despite the destruction the city suffered during these battles, it is one of the best preserved cities in Japan and was fortunate to have escaped the damaging effects of World War II. It has become a favorite tourist destination in Japan offering 1600 Buddhist Temples, 400 Shinto Shrines, palaces, parks and gardens. It is well connected to other cities by high speed rail, is the center of the Japanese television and film industries and has no shortage of fascinating museums, high end shopping and first rate restaurants. Authentic Japanese culture abounds with everything from traditional tea ceremonies to Geisha performances offering unique experiences to the traveler. 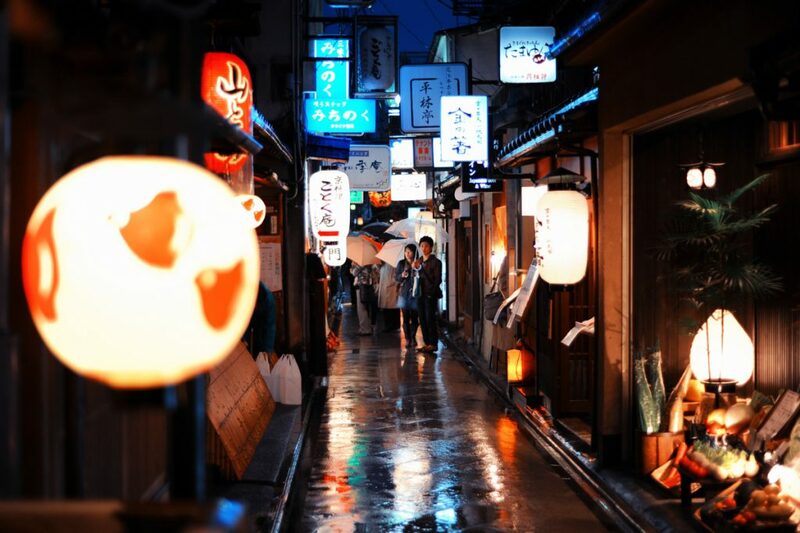 Starting with the ‘Geisha District’ of Gion is a favorite option. Gion is an area distinguished by willow-lined roads, tea houses, wooden guest houses and antique shops. It is especially noted for the thriving Geisha culture in its establishments. 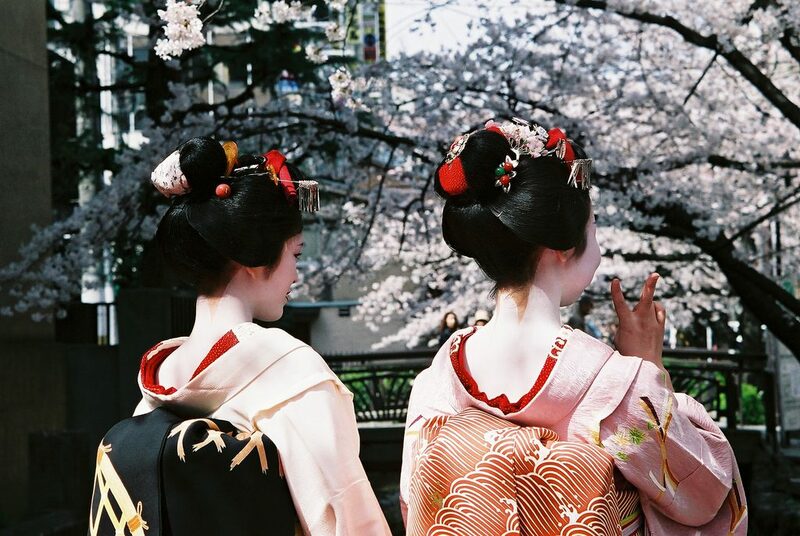 The Geisha are women trained from a young age in all aspects of traditional Japanese culture. They carefully preserve old traditions and entertain through singing, dancing, games and conversation. It can be quite costly to hire them, with a prices starting at around $500 for a dinner. Fortunately there are alternative ways that are less expensive to see a Geisha perform. The Gion Corner Theater features performances of Geishas and in the month of April, the Miyako Odori Festival likewise features performances for the public. 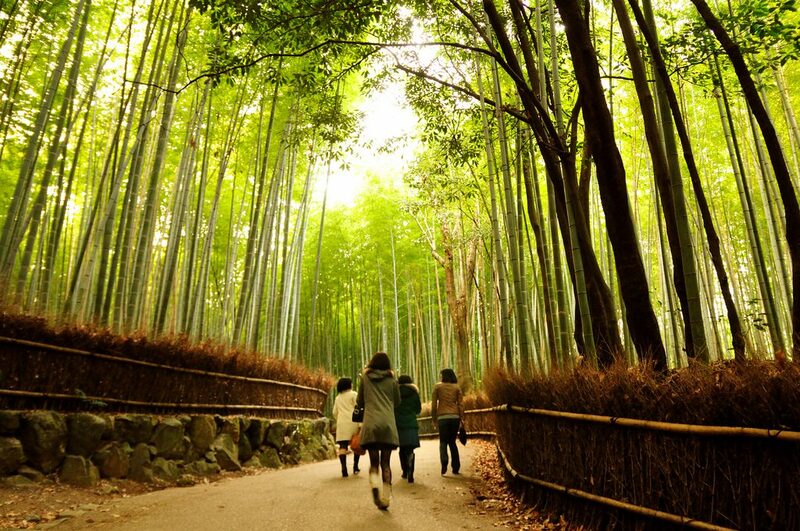 Another beautiful area is the Arashiyama District. 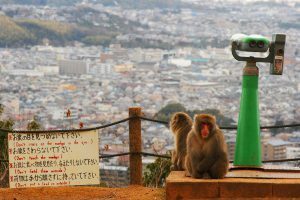 This beautiful area is known for its bamboo groves, gardens, parks and scenery, as well as the Monkey Park Iwatayama, which houses 130 wild snow monkeys. Don’t miss the beautiful Togetsukyo Bridge over the Katsura River, which has become an icon of the Japanese traditional aesthetic. The Nishiki Market, which is five blocks long with around 126 stalls is a fun place to completely immerse yourself in Japanese culture. There is a vast array of foods and products, many of which will seem strange, exotic or weird to the non native. 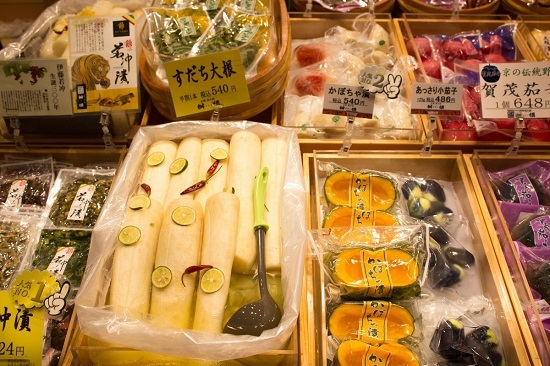 The market is sometimes known as ‘Kyoto’s Kitchen’ and has several sit down establishments. Of the many shrines and temples in the city, there are a handful that many would consider having must visit status. The first is the Fushimi Inari-taisha shrine. This 1300 year old Shinto Shrine is located on a wooded mountainside. 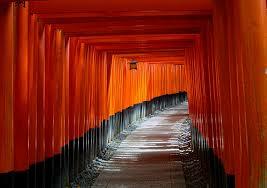 Dedicated to Inari, the God of Rice and Sake, this shrine is noted for the 10,000 red and orange gates lining the ascent to its location. The gates, known as torii, were donated by businesses as a thank you for wishes that had been granted, or to make a wish. There are tea houses and restaurants along the way and the shrine is open 24 hours and free to the public. 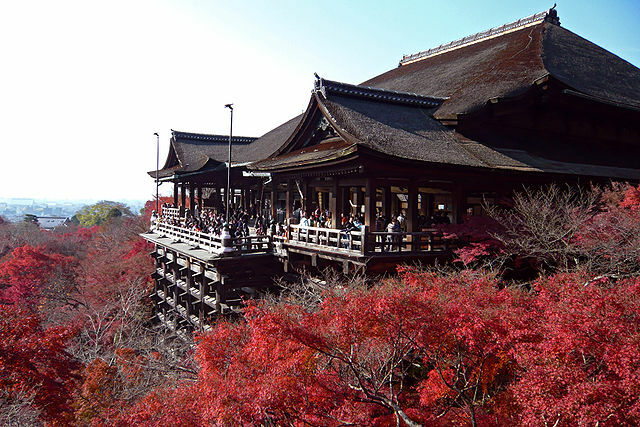 The Kiyomizu Temple is noted for the spectacular scenery at its location and the views from the temple’s main building veranda. Especially magical during cherry blossom season or when there is fall foliage, the experience should include a drink from the waterfall, who’s waters are said to bring health and good fortune. Kiyomizu means ‘pure water’. One of the shrines in the temple complex is the Jishu shrine to the God of Love, a popular destination for those seeking love or ‘good matches’. 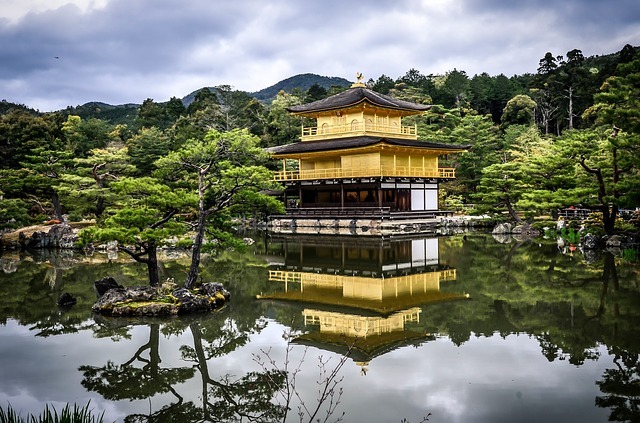 The Kinkakuji Temple, whose gold leafed exterior is mirrored in a lake, was at one time the residence of Shogun Ashikaga Yoshimitsu, but was converted into a Zen Buddhist temple after his death. The name means Golden Pavilion. In 1950, an unhappy monk set fire to the temple and it was completely destroyed. In 1955 a new temple was built, closely replicating the original, although it is thought that there is even more gold leaf on this one than the original. Do not confuse the Kinkakuji Temple with the Ginkakuji, or Silver Pavilion, which was also built for a Shogun and converted into a Zen Buddhist Temple. It, however, does not have any of the silver indicated by its name, possibly because funds were too short, or because the silver was an effect caused by the moon at night. But noone knows for sure. The Sanjusangendo Temple is, at 400 feet, the longest wooden structure in Japan. 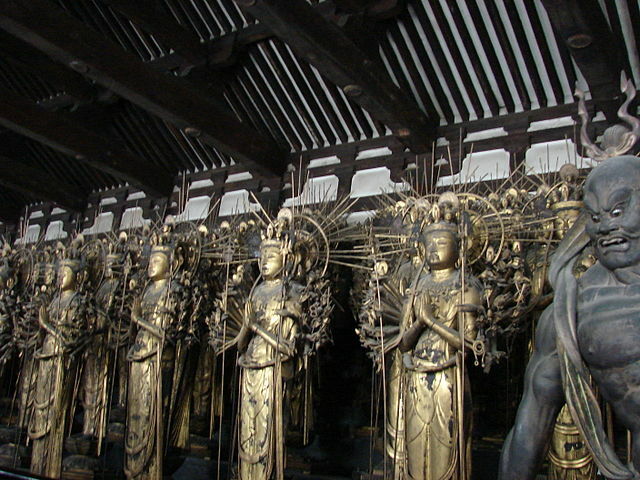 It is surrounded by 1,001 statues of Kannon, the Buddhist Goddess of Mercy, carved in the 12th and 13th centuries. 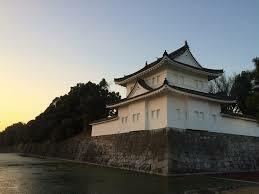 Nijo Castle is surrounded by two rings of fortifications, each with a moat. It was built to show of Shogun Tokugawa Ieyasu’s prestige. It contains two palaces, several outbuildings and several gardens and groves. Dating back to 1679, the complex was donated to the city of Kyoto in 1939 by the imperial family and is open to the public. Of course there is also a modern side to Kyoto as well. 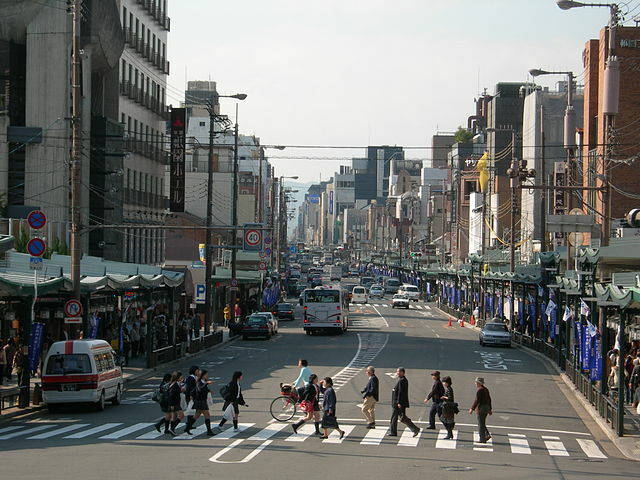 Shoppers will not be disappointed by the Shijo-Dori shopping district, which features name brand boutiques, large department stores and souvenir shops aplenty. Another way to pass the time is to visit one of the many museums such as the National Museum of Modern Art, Kyoto Municipal Museum of Art, the Hosomi Museum, featuring art of the 4th through 19th centuries, or the Manga Museum, which features displays of Manga, the popular Japanese style of comics. There are many tours available for the visitor. Cultural tours, food tours, night tours and much more are offered and are an educational and practical way to see this beautiful old city.